According to Vanessa Hickman, Executive Director of the State Land Dept. 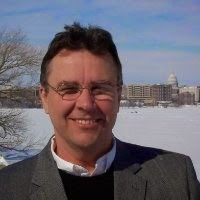 "Curtis has lived and worked in Wisconsin for many years as that state’s Geographic Information Officer (GIO), where he was responsible for the statewide coordination of all GIS partnerships and resources. One of his key recent accomplishments was building and implementing a State Spatial Data Repository. This experience will serve him and the Land Department well as we continue our efforts as a member of the Governor’s Natural Resource Review Council (NRRC), the NRRC GIS subcommittee and the NRRC Clearinghouse subcommittee. Within this GIO role, Curtis has routinely been called upon to lead coordination meetings with public stakeholders, legislators and business executives in order to design and optimize GIS solutions at the statewide level. Curtis also worked for nearly a decade for the Wisconsin Department of Transportation as GIS manager. Before that he lived and worked in Arizona for Pima County as a GIS professional, so he is familiar with many of the unique challenges and opportunities we manage."